Sea otters may be fierce predators but they have a number of physiological characteristics that make them particularly vulnerable to disturbance. In particular, sea otters have a very high demand for energy and spend a large portion of their time resting to conserve energy and foraging to get energy. Disturbance can disrupt these critical activities. To learn more about these unique vulnerabilities, roll your mouse over the image below. Their dense fur traps air, forming a layer of insulation against cold sea water. Sea otters spend 8-15% of their day grooming their fur to keep it in working order. Their hot furnace of a metabolism generates body heat. This furnace needs to be stoked with fuel in the form of prey, and sea otters must eat as much as 25% of their body weight each day to stay healthy and warm. Since they lack the blubber layer of other marine mammals, they rely solely on fur for insulation AND have little ability to store energy as fat. They have no savings in their energy account, and must balance their energy checkbook (income = food, output = activity and staying warm) each day. 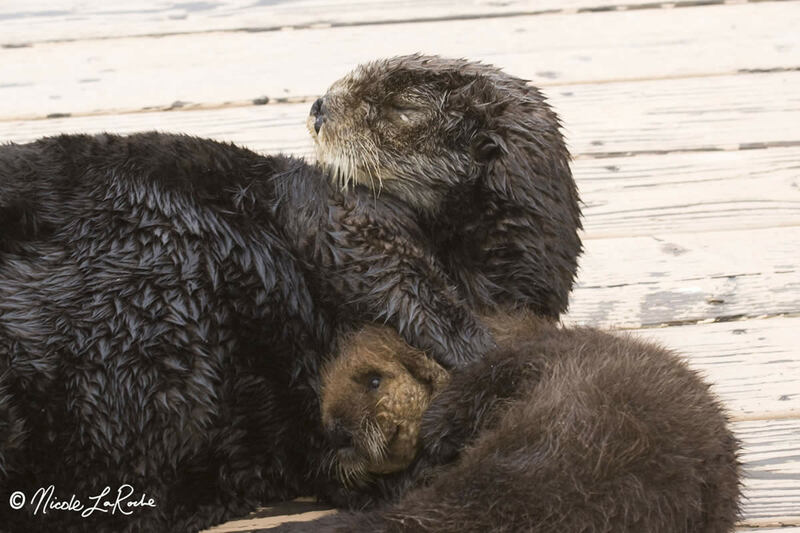 Between producing milk to nurse their pups and sharing their prey with them, sea otter moms will expend 2X as much energy as when they don’t have a pup. That’s a lot of extra food to find each day! Swimming away from encroaching humans uses vital energy that mother sea otters can't afford to waste!